The Blues. Jazz. Skyscrapers. Riverboats. The Loop. The French Quarter. Deep Dish Pizza. Gumbo. The Magnificent Mile. Bourbon Street. “Sweet Home Chicago“. “When the Saints Go Marching In“. Unbelievably, these are just a small sampling of the sights, sounds, and smells of Chicago and New Orleans, two of America’s most exciting and culturally-rich cities. Although Chicago and New Orleans are 1,500 miles apart, they share a very special connection. A very special rail connection, that is. Rail has connected these cities since the middle part of the 20th Century, with the most famous line between the cities being the train called the City of New Orleans. 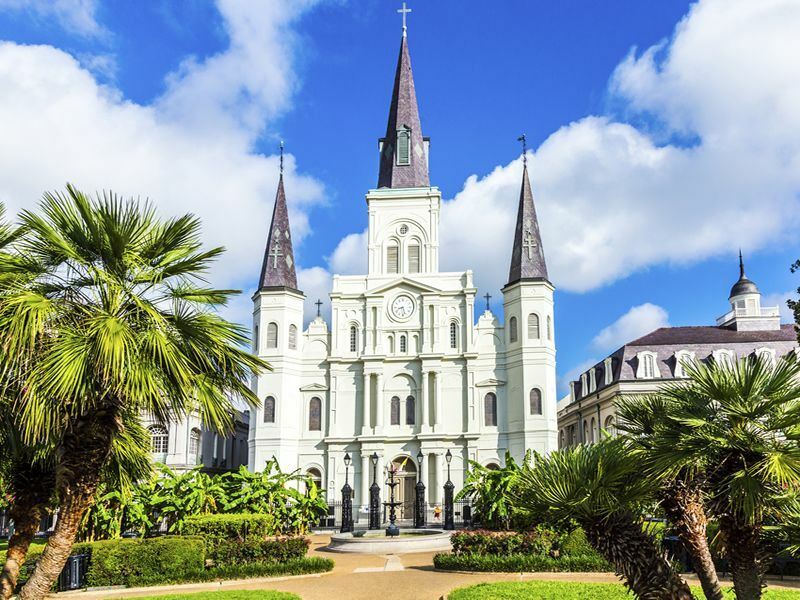 In fact, the City Of New Orleans became so iconic that in the 1970’s, a folk song was penned about it, which has since been made famous by legendary singers such as Woodie Guthrie, John Denver and Willie Nelson. The train journey from Chicago to New Orleans is considered a quintessentially American adventure. With American Sky, you now have the chance to punch your ticket on this classic route by riding a vintage Pullman train and reliving the glory days of the City of New Orleans on this vintage rail journey. Here are some of the best reasons to take this journey and some of my favourite elements of these two fascinating cities. The sultry sound of the blues was born in the southern states of the United States, but soon migrated to large northern cities, and Chicago was one of the places where it flourished. Blues clubs still dot the city and almost every night of the week you can find live blues being soulfully sung in Chicago. Jazz music and its free styling nature is one of the most unique and revered types of music on the planet, and it was born in New Orleans. Catching a live performance of jazz in New Orleans is like seeing flamenco in Spain, it is the genuine article. From elegant concert clubs to smoky dive bars and street corners, jazz is everywhere in New Orleans. New Orleans might be the only city in the world where spotting a tuba player walking down the street holding their instrument over his or her shoulder is commonplace. Yep, it’s that kind of a town. Chicago was the place where the first skyscraper in the United States was built, and to this day the skyline of The Windy City is famous for them. The most famous of the group, The Willis Tower, (formerly the Sears Tower) reigned as the tallest building in the world for 25 years. You can get breath-taking views of the city and of Lake Michigan from the observation deck at the top of the tower. Speaking of Lake Michigan, when the sun comes out in the summer, her sandy shores sizzle by turning into one gigantic beach for the residents of Chicago. There certainly aren’t many other beaches in the world that are lucky enough to have a skyline like Chicago’s as a backdrop, and many visitors don’t even realise that there is a stretch of sand right behind that imposing line of buildings. In New Orleans, the buildings may not rise as high, but they still have the tendency to take your breath away. The mixture of styles on display here run the gamut from brick constructed and lattice-balconied French Quarter beauties to graceful pillared mansions planted along St. Charles Avenue. New Orleans is like no other city in the United States in its personality, its history, and its architecture. A stroll down to the riverfront of the Mississippi River or a ride on a historic riverboat will put much of this history in perspective. Chicago has brought the world deep-dish pizza, and even though most people who try it can only finish a slice or two, they are forever thankful. The origins of this delicious dish are murky, but the essential element is that the crust is thick like a pie and the sauce goes on top of the toppings. Other Chicago favourites are the Italian Beef Sandwich and the Chicago-style hot dog. In New Orleans, eating is considered a pastime and your taste buds will delight in flavours you have never had before. With much of the food in New Orleans, you can almost taste the uniqueness in their name. Dishes like gumbo, jambalaya, and crawfish étouffée are all from this cultural stew of a town and delight locals and tourists alike. So, as you can see, The Windy City and The Big Easy aren’t simply connected by their humorous monikers. There is a rich cultural tapestry to both cities and they are inexplicably linked by their location close to the water, their multicultural cuisine and their diverse cityscape. This is truly an unforgettable train journey and one that will open your eyes to some of the most thrilling aspects of the USA. You can’t get better than that.